Bohle D. Europas andere Peripherie. Osteuropa in der Krise. Das Argument. 2013;301:118-29. Bohle D. Post-socialist housing meets transnational finance: Foreign banks, mortgage lending, and the privatization of welfare in Hungary and Estonia. Review of International Political Economy. 2013. With the collapse of the Council for Mutual Economic Assistance in 1991, the Eastern European nations of the former socialist bloc had to figure out their newly capitalist future. Capitalism, they found, was not a single set of political-economic relations. Rather, they each had to decide what sort of capitalist nation to become. 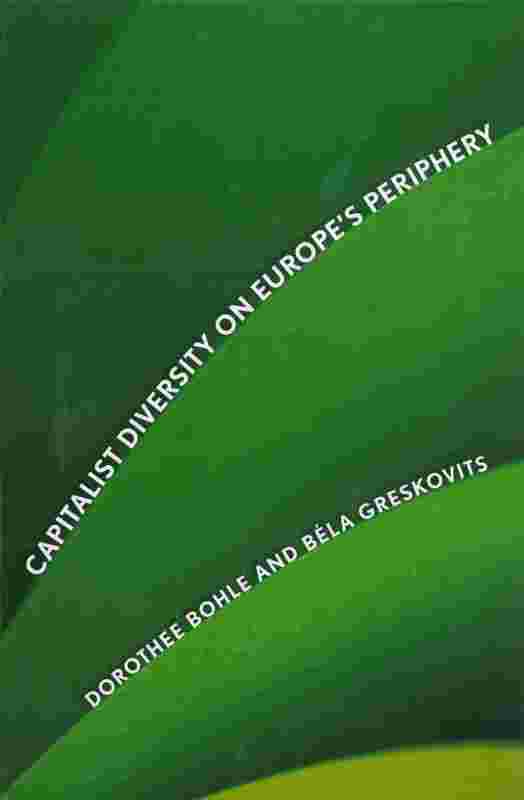 In Capitalist Diversity on Europe's Periphery, Dorothee Bohle and Béla Geskovits trace the form that capitalism took in each country, the assets and liabilities left behind by socialism, the transformational strategies embraced by political and technocratic elites, and the influence of transnational actors and institutions. They also evaluate the impact of three regional shocks: the recession of the early 1990s, the rolling global financial crisis that started in July 1997, and the political shocks that attended EU enlargement in 2004. Bohle and Greskovits show that the postsocialist states have established three basic variants of capitalist political economy: neoliberal, embedded neoliberal, and neocorporatist. The Baltic states followed a neoliberal prescription: low controls on capital, open markets, reduced provisions for social welfare. The larger states of central and eastern Europe (Poland, Hungary, and the Czech and Slovak republics) have used foreign investment to stimulate export industries but retained social welfare regimes and substantial government power to enforce industrial policy. Slovenia has proved to be an outlier, successfully mixing competitive industries and neocorporatist social inclusion. Bohle and Greskovits also describe the political contention over such arrangements in Romania, Bulgaria, and Croatia. A highly original and theoretically sophisticated typology of capitalism in postsocialist Europe, this book is unique in the breadth and depth of its conceptually coherent and empirically rich comparative analysis. Bohle D, Greskovits B. East-Central Europe's Quandary. In: Fukuyama F, Diamond L, Plattner MF, editors. Poverty, Inequality, and Democracy. Baltimore: The John Hopkins University Press; 2012. p. 91-104. Bohle D. East European Transformation and the Paradoxes of Transnationalization. In: DeBardeleben J, Hurrelmann A, editors. Transnational Europe: Promise, Paradox, Limits. New York: Palgrave MacMillan; 2011. p. 130-51. (Palgrave studies in European Union politics). Bohle D. Trade Unions and the Fiscal Crisis of the State. 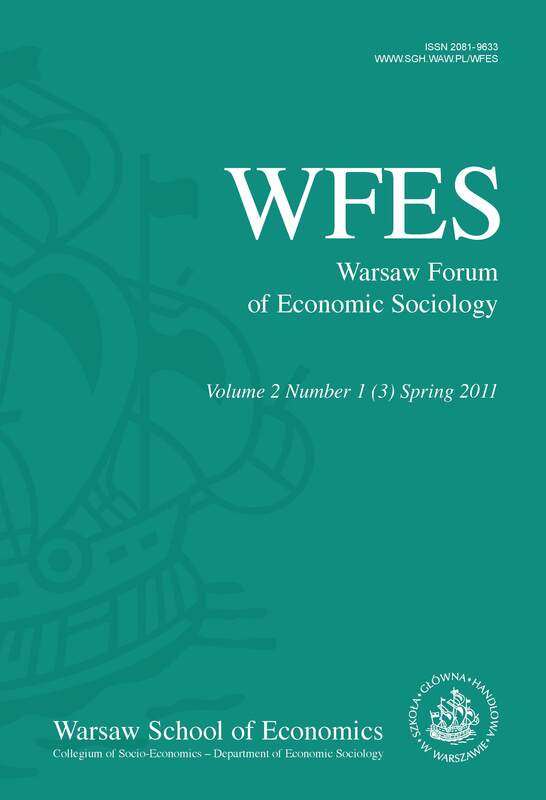 Warsaw Forum of Economic Sociology. 2011;2(1):89-106. Bohle D. An Elusive region: East-Central Europe in the Crisis. Perspectives on Europe. 2011;41(2):34-9. Bohle D, Greskovits B. Slovakia and Hungary: successful and failed euro entry without social pacts. In: Pochet P, Keune M, Natalie D, editors. After the Euro and Enlargement: Social Pacts in the EU. Brussels: ETUI; 2010. p. 345-70. Bohle D, Sadowski D. Transnationale Unternehmen und Gewerkschaften in Osteuropa. Industrielle Beziehungen. 2010;17(2):119-22. Bohle D. The Protracted Revolution. ; 2010. Bohle D, Greskovits B. Patterns of Social Exclusion and Inclusion in East-Central Europe. ; 2010. Bohle D. East European Transformation and the Paradoxes of Transnationalization. Florence: European University Institute. Department of Political and Social Sciences; 2010. Bohle D. The Crisis of the Eurozone. European University Institute. Robet Shuman Centre for Advanced Studies ; 2010. Bohle D. Race to the Bottom? Transnational Companies and Reinforced Competition in the enlarged European Union. In: Van Apeldoorn B, Drahokoupil J, Horn L, editors. Neoliberal European Governance and Beyond—The Contradictions and Limtys of a Political Project. Basingstoke: Palgrave Macmillan; 2009. p. 163-86. Greskovits B, Bohle D. Varieties of Capitalism or Capitalism 'Tout Court'. European Journal of Sociology. 2009;50(3):355-86. Greskovits B, Bohle D. Poverty, Inequality and Democracy: East-Central Europe's Quandary. Journal of Democracy. 2009;20(4):50-63. Greskovits B, Bohle D. Wirtschaftswunder und Staatsverschuldung. Zur Politischen Ökonomie Osteuropas. Osteuropa. 2009;59(2-3):349-56. Manufacturing miracles, welfare pathologies and the accumulation of national debt. On the political economy of east central Europe 20 years of democracy and market economics in east central Europe have been a great success. This distinguishes Poland, the Czech Republic, Slovakia, and Hungary from almost all of the other post-Socialist states. Their model of success has two components. First, these four states succeeded in becoming the manufacturing site for trans-national companies. That creates jobs and brings capital into the region. Second, the governments softened the social hardships of the transformation by means of welfare state policies. The price is an enormous national debt. Since EU accession, it has been necessary to take action against this. Dissatisfaction is growing, and populist forces are increasingly supported. Bohle D. East European Capitalism – What Went Wrong? Intervention. European Journal of Economics and Economic Policies. 2009;6(1):32-43. East European Capitalism – What Went Wrong? Not all that long ago, the East European newcomers to the European Union (EU) were considered economic miracles which successfully weathered the storms of transformation from socialism, and were ready to settle on stable democratic capitalist development paths. It was even assumed that these countries, toughened by the experience of repeated crises in the 1990s and backed by EU-entry requirements, had developed regulations and institutions that would prove resistant to the current global crisis. Things have turned out otherwise. Almost all new EU member states have accumulated major economic imbalances, and are boarding on steep recessions. Two countries – Hungary and Latvia – had already to turn to the International Monetary Fund (IMF) in order to defend their currencies and keep their economies afloat. Other countries of the region are prone to follow. The crisis in Eastern Europe is not only economic. Surging protests and the increasing appeal of political illiberalism in the region attest to an end of the »political economy of patience« which characterized the first years of post-socialist transformation. What has made the region’s democratic capitalist project so vulnerable? This essay seeks for answers by taking as its starting point the worry expressed by many students of the region in the early 1990s that the double transformation to capitalism and democracy constitutes a challenging agenda. The introduction of capitalism was a political project, and it could only succeed if based on strong democratic legitimacy. At the same time, it was however considered highly unlikely that the population would patiently bear the high social costs of transformation without making use of their newly acquired democratic voice to obstruct market reforms. The crucial question, therefore, was whether East European societies could mobilize resources to increase tolerance for the economic costs of transformation. Comparing the Hungarian and Latvian experiences, I argue that both countries relied on a number of methods to make the pains of economic transformation tolerable. While Hungary mitigated the costs through social policies, Latvia – a newly independent state – used identity politics to instill tolerance for social hardship in its society. Th ese domestic resources were however insuffi cient to create solid support for capitalism, and showed already signs of exhaustion during the 1990s. Increasingly, international actors and markets came to the rescue of the fragile capitalist democracies. The EU’s decision to start entry negotiations off ered an external anchor for reforms, and made the countries also much more attractive for international capital fl ows, which were abundant in the 2000s. The tolerance of international markets and institutions for great economic imbalances allowed governments in both countries to grant their population a broader share of the new system’s wealth. The global financial crisis has however pulled the rug out from under such solutions. Greskovits B, Bohle D. Poverty, Inequality, and Democracy (II): East-Central Europe's Quandary. Journal of Democracy. 2009;20(4):50-63. Greskovits B, Bohle D. Wirtschaftswunder und Staatsverschuldung Zur politischen Ökonomie Ostmitteleuropas. Osteuropa. 2009;59(2-3):349-56. 20 Jahre Demokratie und Marktwirtschaft in Ostmitteleuropa sind ein großer Erfolg. Dies unterscheidet Polen, Tschechien, die Slowakei und Ungarn von fast allen anderen postsozialistischen Staaten. Das Erfolgsmodell hat zwei Komponenten. Zum einen ist es den vier Staaten gelungen, zum Fertigungsstandort transnationaler Konzerne zu werden. Das schafft Arbeitsplätze und bringt Kapital in die Region. Zum anderen haben die Regierungen die sozialen Härten der Transformation wohlfahrtsstaatlich abgefedert. Der Preis ist eine enorme Staatsverschuldung. Seit dem EU-Beitritt muss gegen diese vorgegangen werden. Die Unzufriedenheit wächst, populistische Kräfte finden immer mehr Zulauf. B. G, Bohle D. Puti razvitiia evropeiskoi periferii : sravnitelnoi analiz vozvrashcheniia v Evropu Vengrii i Polshi. In: Horvath J, editor. Perekhodnyi period v ekonomike Tsentralnoi Evropy : itogi pervogo desiatiletiia. Vol 2008. Moskva: Logos; 2008. p. 108-48. (Tsentralno-Evropeiskii almanakh; vol 2008). B. G, Bohle D. Állam, nemzetköziesedés és a kapitalizmus változatai Kelet-Európában. Fordulat. 2008;1(tél):9-36. Ez a tanulmány a kelet-európai kapitalizmusok változatosságával foglalkozik, az erről szóló irodalomhoz három dimenzióban járul hozzá. Az első, hogy empirikusan négyféle kapitalista rezsimtípus azonosítható be intézményi konfigurációik és azok teljesítményei alapján: a balti államok állam által vezérelt neoliberális, a volt FÁK-országoknak az előző csoportnál direktebben piac által vezérelt neoliberális, a visegrádi államok beágyazott neoliberális, valamint a szlovének neokorporatista rezsimje. A második dimenzió, hogy a kapitalista rendszerek diverzitását egyrészt külső tényezők bonyolult összjátéka magyarázza, különösen a globális áru- és pénzpiacok, a nemzetközi intézmények és a külföldi közvetlen tőkebefektetések, másrészt a reformok megvalósítására vonatkozó különböző szintű állami kapacitások. Harmadsorban: óvatosan kell eljárni a domináns összehasonlító politikai gazdaságtani megközelítés, a kapitalizmus változatainak egy az egyben történő, a térség elemzéséhez való felhasználásakor, mivel az nem illeszkedik az ottani intézmények kialakulásának körülményeihez, azok nemzetközi beágyazottságához és a kelet-európai piacgazdaságok félperifériás jellegéhez. Bohle D, Neunhöffer G. Why is there no third way? : The role of neoliberal ideology, networks and think-tanks in combating market socialism and shaping transformation in Poland. In: Plehwe D, Walpen B, Neunhöffer G, editors. Neoliberal hegemony : a global critique. Vol 18. London: Routledge; 2007. p. 89-105. (Routledge/RIPE Series In Global Political Economy; vol 18). Greskovits B, Bohle D. Neoliberalismus, eingebetteter Neoliberalismus, und neo-Korporatismus: Socialistische Hinterlassenschaften, transnationale Integration und die Diversitaet osteuropaeischer Kapitalismen. In: Segert D, editor. Postsozialismus. Hinterlassenschaften des Staatssozialismus und neue Kapitalismen in Europa. Wien: Braumüller; 2007. p. 185-205. (Studien zur politischen Wirklichkeit). Bohle D, Greskovits B. Neoliberalism, embedded neoliberalism, and neocorporatism: Paths towards transnational capitalism in Central-Eastern Europe. West European Politics. 2007;30(3):443-66. Bohle D, Radice H, Shields S. Introduction to the State, Internationalization, and Capitalist Diversity in Eastern Europe. Competition and Change. 2007;11(2):81-7. State, Capital and Labour: The Political Economy of Capitalist Diversity in Eastern Europe.. 2007. Bohle D, Greskovits B. The State, Internationalization, and Capitalist Diversity in Eastern Europe. Competition and Change. 2007;11(2):89-115. This article contributes to the debate on varieties of capitalism in Eastern Europe in three ways. First, four types of capitalist regimes that differ in particular institutional configurations and performances are empirically identified: the state-crafted neoliberalism of the Baltic States, the more directly world-market driven neoliberalism of the CIS countries, the embedded neoliberalism of the Visegrad countries, and neo-corporatism in Slovenia. Second, the diversity of capitalist regimes--is explained as a result of the complex interplay of external factors--specifically world commodity and financial markets, international institutions and foreign direct investment--and different state capacities to implement reform choices. Third, caution is given against an uncritical application of the dominant approach of comparative political economy, varieties of capitalism, since it is ill suited to study the emergence of institutions, their international embeddedness, and the semiperipheral character of East European capitalisms. Bohle D, Greskovits B. Capitalist Diversity in Eastern Europe. European Economic Sociology Newsletter. 2007:3-9. Greskovits B, Bohle D. A transnacionális kapitalizmus változatai Kelet-Közép-Európában. Politikatudományi Szemle. 2007;16(2):7-32. Cikkünk tárgya a szocialista rendszer bukása után Kelet-Közép-Európában kialakult háromfajta kapitalizmusnak, a balti államok tisztán neoliberális, a visegrádi országok beágyazott neoliberális, és Szlovénia neokorporatista rendszerének elemzése. Bemutatjuk, hogy a három országcsoportban az eltérõ mértékû és arányú állami beavatkozás különbözõ intézményi szerkezetre és teljesítményre vezetett négy fontos szférában: a piaci intézmények, az ipar növekedése és szerkezetváltása, a társadalmi kohézió fenntartása, és a makrogazdasági stabilitás területén. Az eltérõ rendszerek kialakulását két tényezõ összjátékával magyarázzuk. E gyrészt kulcsszerepet tulajdonítunk a szocializmus összeomlását közvetlenül követõ idõszak politikai döntéseinek. E lemezzük, hogy hogyan befolyásolta e döntéseket a szocialista rendszer öröksége, és az, hogy a politika szereplõi az örökséget a nemzeti függetlenség és a gazdasági fejlõdés zálogának vagy inkább akadályának tekintették-e. E különbségek azt is érthetõbbé teszik, miért volt más és más mértékû a három kapitalista rendszerrel szembeni társadalmi ellenállás, és miért tért el a politikai verseny és a kialakuló demokrácia jellege. Másrészt kiemelt fontosságot tulajdonítunk a nemzetközi és transznacionális tényezõk, különösen az Európai Unió és a nemzetközi nagyvállalatok hatásának. Bohle D. Wohlfahrtsstaaten unter Stress. Vol 19.; 2007. Bohle D. Neo-Gramscianism. In: Robertson R, Scholte JA, editors. Encyclopedia of Globalization. London: Routledge; 2006. Bohle D. Neoliberalismus, eingebetteter Neoliberalismus, Neokorporatismus: Sozialistische Hinterlassenschaften, transnationale Integration und die Diversitaet osteuropaeischer Kapitalismen. In: Segert D, editor. Postsozialismus. Vienna: Braumueller Verlag; 2006. p. 185-206. Greskovits B, Bohle D. Europeanization and the Variety of Competition States in Central-Eastern Europe. In: Ágh A, Ferencz A, editors. Deepening and Widening in an Enlarged Europe: The Impact of Eastern Enlargement. Budapest: 'Together for Europe' Research Center of the Hungarian Academy of Sciences; 2006. p. 245-86. (Together for Europe series). Bohle D. Neoliberal Hegemony, Transnational Capital and the Terms of the EU's Eastward Expansion. Capital & Class. 2006;30:57-86. Informed by a neo-Gramscian framework of analysis, this paper investigates the nature of neoliberal hegemony in the EU, & its consequences for the terms of enlargement. It will argue that both the deepening & enlargement of the EU are promoted by a historical bloc that seeks to establish the hegemony of transnational capital. In western Europe, socialdemocratic political forces, organised labour & the political forces of the peripheral countries have been incorporated into the historical bloc, albeit in a subordinated position. As a result, a precarious hegemonic constellation of "embedded neoliberalism" has emerged. In contrast, the EU has exported a more "market-radical" variant of neoliberalism to its new member states. This best serves the interests of transnational capital, & helps to preserve the order of "embedded neoliberalism" within the old EU. Eastern European societies have not been in a position to question the unequal terms of enlargement. This can be explained by their specific legacies, which have led to their incorporation into the transnational historical bloc through passive revolution. References. Adapted from the source document. Bohle D. Race to the bottom? : die Dynamik der Konkurrenzbeziehungen in der erweiterten EU. PROKLA Zeitschrift für kritische Sozialwissenschaft. 2006;36(3):343-60. Bohle D. Capitalism without Compromise: Strong Business and Weak Labor in Eastern Europe’s New Transnational Industries. Studies in Comparative International Development. 2006;41(1):3-25. This paper contributes to the debate on the social impact of globalization. It focuses on the mediating role of the sectoral pattern of transnational production relocation to the postcommunist economies of Eastern Europe. We argue that the collapse of the socialist heavy industries and the eastward relocation of traditional light industries initially forced the social conditions of the East European countries to converge at the bottom and deepened the gap between the West and the East. Later, the eastward migration of high-skilled labor and capital-intensive industries and jobs led to decreasing social disparity between the West and some of the former socialist countries. However, convergence appears uncertain, costly, and uneven, and coincides with increasing social disparity within the group of East European new members and candidates of the European Union. Bohle D. Race to the bottom? Die Dynamik der Konkurrenzbeziehungen in der erweiterten Europäischen Union. PROKLA. Zeitschrift für kritische Sozialwissenschaft. 2006;36(3):343-61. Greskovits B, Bohle D. Capitalism without Compromise: Strong Business and Weak Labor in Eastern Europe's New Transnational Industries. Studies in Comparative International Development. 2006;41(1):3-25. This paper contributes to the debate on the social impact of globalization. It focuses on the mediating role of the sectoral pattern of transnational production relocation to the postcommunist economies of Eastern Europe. We argue that the collapse of the socialist heavy industries and the eastward relocation of traditional light industries initially forced the social conditions of the East European countries to converge at the bottom and deepened the gap between the West and the East. Later, the east-ward migration of high-skilled labor and capital-intensive industries and jobs led to decreasing social disparity between the West and some of the former socialist countries. However, convergence appears uncertain, costly, and uneven, and coincides with increasing social disparity within the group of East European new members and candidates of the European Union. Bohle D. Neogramscianismus : Stephen Gill. In: Bieling H-J, Lerch M, editors. Theorien der europäischen Integration. Opladen: Leske und Budrich; 2005. p. 201-25. Bohle D, Husz D. Whose Europe is it? Interest Group Action in Accession Negotiations: The Cases of Competition Policy and Labor Migration. Politique Europeenne. 2005;15(4):8-112. Bohle D, Husz D. Whose Europe is it? Interest group action in accession negotiations : the cases of competition policy and labor migration. Politique européenne. 2005;15(1):85-112. Bohle D. The EU and Eastern Europe : failing the test as a better world power. In: Panitch L, Leys C, editors. Socialist Register 2005: The Empire Reloaded. Vol 2005. London: Merlin Press; 2004. p. 301-12. (Socialist register; vol 2005). If Europe indeed represents a distinctive, and better, civilization than the US, this should be reflected in how the EU has reshaped Eastern Europe after the breakdown of socialism. After all, this was the first historical opportunity for the EU to live up to its own ambitions in world politics. However, instead of exporting welfare capitalism and a security order based on multilateralism and human rights, EU expansion has entailed the re-emergence of economic center-periphery relations within the new Europe. Moreover, Western European states bear a heavy dose of responsibility for the violent break-up of Yugoslavia. The left-liberal vision of Europe as the better world power is based on an unwillingness to critically engage with the EU's conduct of its external relations, and wishful thinking concerning Europe's autonomy vis-a-vis the US. Bohle D. Harsche Bedingungen für Osteuropas Rückkehr nach Europa : Woher kommen sie? : Warum gibt es nicht mehr Widerstand? Kurswechsel. 2004;19(1):52-9. Harsche Bedingungen für Osteuropas Rückkehr nach Europa : Woher kommen sie? : Warum gibt es nicht mehr Widerstand? Tough Conditions for Eastern Europe’s Return to Europe – what is their origin, and why is there no resistance? Bohle D, Greskovits B. Ein Sozialmodell an der Grenze. Kapitalismus ohne Kompromiss. Osteuropa. 2004;(5-6):372-86. Bohle D, Greskovits B. Capital, Labor and the Prospects of the European Social Model in the East. Harvard: Minda de Gunzburg Center for European Studies; 2004. Bohle D. Imperialism, peripheral capitalism and European unification : some preliminary reflections. In: Beckman D, Bieling H-J, Deppe F, editors. The Emergence of a New Euro Capitalism? : Implications for Analysis and Politics. Vol 18. Marburg: FEG; 2003. (Forschungsgruppe Europäische Gemeinschaften (FEG); vol 18). Bohle D. Osterweiterung der EU : Neuer Impuls oder Rückschlag für die Europäische Integration? In: Beckmann M, Bieling H-J, Deppe F, editors. Euro-Kapitalismus und globale politische Ökonomie. Hamburg: VSA-Verlag; 2003. p. 144-68. Osterweiterung der EU : Neuer Impuls oder Rückschlag für die Europäische Integration? Eastern Enlargement: New Stimulus or Backlash for European Integration?Conference proceedings. Bohle D. A Cold Welcome : The Unequal Terms of Eastern Enlargement. Global Dialogue. 2003;5(3):19-29. Bohle D. Imperialismus, peripherer Kapitalismus und europäische Einigung. Z : Zeitschrift Marxistische Erneuerung. 2003;(54):19-33. Bohle D. Neoliberális szerkezetváltás és transznacionális tőke az európai integráció elmélyítésében és az EU bővítésében. Eszmélet. 2003;15(59):102-26. Bohle D, Husz D. Whose Europe is it? Der Öffentliche Sektor : Forschungsmemoranden. 2003;29(2-3). 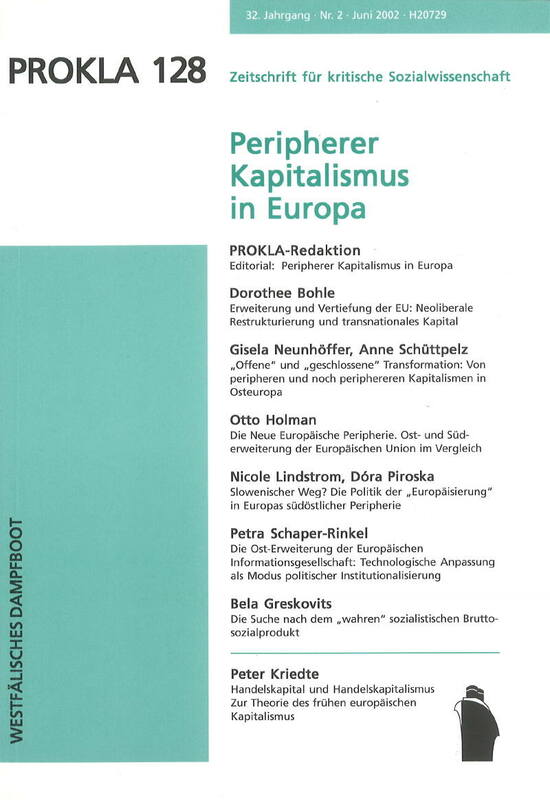 Bohle D, Bieling H-, Deppe F, Gindin S, Panitch L, Scheiter C. The Emergence of a New Euro Capitalism? Implications for Analysis and Politics. Forschungsgruppe Europäische Genteinschaften (FEG) ed. Beckmann M, Bieling H-J, Deppe F, editors. Marburg: Universität Marburg; 2003. Bohle D. Europas neue Peripherie : Transformation und transnationale Integration. Münster: Westfälische Damfboot; 2002. Peripherer Kapitalismus in Europa. Bohle D, editor. Berlin: PROKLA Zeitschrift für kritische Sozialwissenschaft; 2002. Bohle D. Erweiterung und Vertiefung der EU: Neoliberale Restrukturierung und transnationales Kapital. PROKLA Zeitschrift für kritische Sozialwissenschaft. 2002;32(3):353-79. Greskovits B, Bohle D. Development Paths on Europe's Periphery: Hungary's and Poland's Return to Europe Compared. Polish Sociological Review. 2001;33(1):3-27. The authors argue that the successful economic & political development of Hungary & Poland in the 1990s, in part, is due to their relatively favorable "communist legacy" including the continuous existence of their nations & states, their legacies of economic & political freedom; & the relatively modest distortions of their economies. In contrast to these similarities, it is mainly the differences of these countries' strategic choices & commitments after the collapse of communism that explain the divergence of their development paths. In the authors' view, Hungarian capitalism can be called "foreign-led" in the sense that most leading industries & services are oriented toward, & dependent on, foreign markets & finance, & are operated by foreign owners, typically multinational firms & banks. Poland, in turn, seems to have attempted a "national capitalist" trajectory. Unlike the Hungarian, the Polish economy is significantly less export-oriented, & relies much less on foreign direct investment & foreign ownership. Furthermore, at least during the period 1994-1997, the Polish state took responsibilities for a number of strategic sectors. Although this state-capitalist project crumbles down, it still significantly shapes the development path Poland is traveling on today. 58 References. Adapted from the source document. Bohle D. EU-Integration und Osterweiterung : Die Konturen einer neuen europäischen Unordnung. In: Bieling H-J, Steinhilber J, editors. Die Konfiguration Europas : Dimensionen einer kritischen Integrationstheorie. Münster: Westfälisches Dampfboot; 2000. p. 304-30. Bohle D. Internationalisation : An Issue Neglected in the Path-Dependency Approach to Post-Communist Transformation. In: Dobry M, editor. Democratic and Capitalist Transitions in Eastern Europe : Lessons for the Social Sciences. Vol 55. Dordrecht: Kluwer Academic Publishers; 2000. p. 235-61. (Geojournal library; vol 55). Bohle D. Világgazdasági nyitás és duális intézményrendszer : a szállítási ágazat esete Lengyelországban. Külgazdaság. 2000;44(1):65-78. Bohle D. European Integration and Institutional Fragmentation: The Case of the Polich Transport Industry. Acta Oeconomica. 1999;50(3-4):351-70. The author demonstrates that Europe is heading towards the emergence of a transnational integrated economy, in which national policies of deregulation are combined with the growing role of supranational institutions and in which new global market actors and new forms of market hierarchies are emerging. As Poland has not been capable of deploying the necessary resources for successful adaptation, a selective approach has been adopted and this works in favour of the needs of international transport while neglecting the restructuring of the domestic transport system. Thus a fragmented and dualistic transport regime has emerged in terms of its institutions and regulations, its geographical patterns, and its infrastructural developments. The article shows that the fragmented regime has created strikingly different firm structures, business and organisational strategies, and ultimately works in favour of multinational forwarding and logistic enterprises. The latter occupy strategic market segments in Poland, whereas the endogenous transport enterprises are in danger of being marginalised. Bohle D. Der Pfad in die Abhängigkeit? : Eine kritische Bewrtung institutionalistischer Beiträge in der Transformationsdebatte. Berlin: Wissenschaftszentrum Berlin für Sozialforschung. Forschungsschwerpunkt Arbeitsmarkt und Beschäftigung; 1999. Bohle D, Plehwe D. Dienstleister in multinationalen Wertschöpfungsnetzwerken Europas : Überlegungen zum Forschungsfeld Transnationale Organisation in Europa. Vol 98-103. Berlin: Wissenschaftszentrum Berlin für Sozialforschung. Forschungsschwerpunkt Arbeitsmarkt und Beschäftigung; 1998. A chapter of a working paper. Bohle D. Zwischen lokaler Anarchie und globalen Netzen : Transformationsprozesse im polnischen Strassengüterverkehr. Berlin: Wissenschaftszentrum Berlin für Sozialforschung. Forschungsschwerpunkt Arbeitsmarkt und Beschäftigung; 1997. Bohle D. Governance im Spätsozialismus : die Herausbildung hybrider Koordinationsformen und informeller Vernetzungen in Ungarn und Polen in den achtziger Jahren. Berlin: Wissenschaftszentrum Berlin für Sozialforschung. Forschungsschwerpunkt Arbeitsmarkt und Beschäftigung; 1996. Bohle D. Women's Employment Activities in the European Community. Perspective from the 1990s. Das Argument. 1995;37(7-8):624-5. Bohle D. EG-Integration und Frauenforschung in Deutschland : Eine kommentierte Literaturübersicht. Marburg: Forschungsgruppe Europäische Gemeinschaften; 1994. Bohle D. Der Europäische Binnenmarkt. Biss Public: Beiträge zur sozialwissenschaftlichen Diskussion; 1993.